I have been filming weddings for over a decade now but you wouldn’t believe the jitters I get the morning before filming a wedding. I still wake up before each wedding nervous and anxious. But, that excitement is even heightened when it’s an Indian wedding and we plan a complex Same Day Edit that requires our team to be on our toes every second to catch exactly the right moments that will be included in that edit. It’s a film that is still in the editing process 15 minutes before “show-time” but we challenge ourselves to include a moment like the Grand Entrance into the Same Day Edit and show our masterpiece just minutes after it happens. Those 15 minutes are stressful but rewarding when we see the couple thrilled and captivated by what we managed to capture. It’s a humbling and rewarding experience for us but more importantly, the bride and groom love seeing the highlights of their day just moments after they occur. A deeper look of what goes into filming and editing a Sikh Indian Same Day Edit (particularly this one in San Jose and Fresno). First off, pulling off something so technical and creative requires a lot of planning and collaboration between our team of 4 cinematographers. This was a 4-day Indian wedding, with the wedding and reception on 2 separate days. We starting off filming pre-wedding functions for this Sikh wedding a few days before the wedding, which began with a Maiyan (Haldi) ceremony in San Jose. I personally love filming pre-wedding functions as they allow me to have colorful and dynamic content and I’m always able to get some of my favorite shots that I include in the Same Day Edit. After filming the Bride’s Maiyan in San Jose, we drove back to Sacramento. But, we were not done for the day just yet. As I mentioned before, during the several days of the celebrations, our team is scrambling to make sure nothing is overlooked. For example, on the way home, my second shooter copies all the captured footage onto a SSD and organizes the video footage. Once I arrive home, I will try to “favorite” whichever shots I find fitting to include in film. I also do a quick backup to a secondary drive. As you can tell by now, we back up our work during many phases of the event because losing anything is just not an option for us. Also, having a project ready with just my “favorites” allows me to have quick access to the collection of shots that I found suitable for the Same Day Edit. I don’t start putting anything together at this time because I don’t feel like I have a full scope of the wedding story yet and our goal is to encompass all the festivities in the Same Day Edit. For this couple, we had another event with the groom in Fresno the next day. I had 2 videographers at the groom’s event and they actually stayed the night in Fresno so they’d be all ready to go the following morning. The wedding day itself is usually a “go with the flow” kinda day so not much can be planned but we do know that our team is there, ready to capture it all. Once the wedding day comes to an end (usually late into the night) and we’re done with all the filming, our “real work” of the film is really only starting. We begin by copying all of the footage on our drive home (or hotel, in this case). That night, we spend a lot of time organizing all the footage into the corresponding folders and even synchronizing (in Pluraleyes) the events that we need to sync from the camera and professional audio devices we used. By the time I go to sleep, everything is copied, organized and synced – no exceptions. And of course, everything is backed up to a secondary hard drive. I only start the editing process the morning of the reception because it gives me the most amount and best account of which footage I want included in the Same Day Edit. So my morning begins at around 7am and I get to editing right away. Keep in mind, I’ve got a head start because I’ve already favorited some of the shots from some of the pre-wedding events. But the biggest event – the wedding day and all that day entailed – is completely untouched. Additionally, the temporary timeline in Final Cut Pro X (10.3) does not include anything from the wedding day so that entire section needs to get mapped out too. That’s where the art of editing a Same Day Edit unfolds. When I get to editing, I try envisioning the Same Day Edit final product. I try to feel out the story and start off by placing sections of the wedding onto the timeline. I’m limited on time so I rely on our experience at this point. I trust my instinct of remembering which shots I purposefully shot to be included in this film. Also, I leave gaps in the film for shots I know for sure I will be using from the reception (that are yet to happen in a few hours). For example, I know I want to include the Grand Entrance of the Bride and Groom so I find an ideal location for that footage and work around that gap in the meantime. I also want to include some up close and detailed footage of the decor from the wedding so I leave another gap in the film for those shots. I really want to capture the genuine essence of the couple’s celebration so I arrange to include those shots once they will be captured. The bride also told me before the wedding about her incorporation of the Bollywood theme. 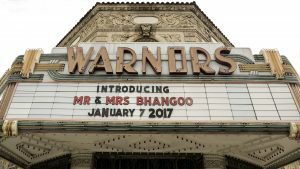 She mentioned that the Warnors theater across the street from their reception venue would update their marquee in the front of the theater to say Mr & Mrs Bhangoo. Warnors Theater marquee sign across the street of The Grand 1401. Introducing Mr & Mrs Bhangoo. An inspirational reception decoration idea. I automatically knew I had to include that shot in the Same Day Edit. So I rush over to the theater and capture a few shots of that sign. While I was filming the theater shot, my brother is in the hotel room sorting through “Vidaii/Doli” and the “Anand Karaj” shots and favoriting the ones I could include in the film (to keep the editing process moving forward). I head right back to our hotel to continue editing and place those shots that I just filmed into the FCPX timeline. At around 2pm, the Same Day Edit is roughly just about finished, except with 2 purposeful gaps in the edit timeline that I still have yet to fill. We arrived to the reception hall The Grand 1401, in Fresno at 4:30pm. We quickly set up our crane (jib) and started to film the details of the hall (for one of the gaps in the Same Day Edit). I love filming with our jib as that gives me some grand flyover shots of the reception hall. By around 6pm, we had all the shots of the beautiful reception decorations that we needed. I collected all of the memory cards from the cameras, copied everything, and started editing away. Meanwhile, all of the guests were beginning to arrive and the videography team kept filming. I was busy filling in the gap with our best reception decor shots and making sure the film was color corrected and color graded. However, there was one more shot sequence I was waiting on – the grand entrance of the lovebirds. I always get an adrenaline rush at this point because the pressure is on. About 30 minutes before the grand entrance, our entire team goes through the shot layout and camera positioning for the Grand Entrance. Because every second counts, we even plan out how the memory cards will be handed off (and in what sequence) to me right after the Grand Entrance happens. So, after a slight delay (on the couple’s part, I promise we were ready), the Grand Entrance is about to happen. We all know it will happen quickly and we have a short turn around time for the Same Day Edit. And then at 8pm it finally happened. The GRAND ENTRANCE of Mr. & Mrs. Bhangoo. I’m on the stabilizer, filming that moment from my angle. Once Davinder and Harpreete had their moment and made it to the stage, I dropped my stabilizer, pulled out my camera SD card, put in a prepared SD card, and ran to the edit bay. (Yep, literally ran.) This is the final moment I needed to complete the Same Day Edit and now that the moment is captured, every second matters. I begin the process of copying the shots I need from my SD card and while that’s copying, I run back to the floor to collect the other memory cards. Each videographer will take out their SD card with the Grand Entrance footage and put in a new SD card. This transaction also requires a lot of care to make sure our team is still filming so at this point, we are rapidly communicating all the details via our headsets. We make sure to have 2 cameras filming at any given time. After collecting all of the memory cards, I run back to the edit bay, put the other 3 cards into the chain of card readers and copy the grand entrance shots. One thing to note: we plan out this transition very thoroughly. We made sure we had our fastest cards in the cameras which allows us to copy the recorded footage to our SSD at the fastest speed possible. When executed perfectly, I have a few extra minutes to edit. By 8:20, the Same Day Edit is finally complete. I’m nervously waiting for the MC to give me the command to press play and at 8:25, the announcement is made. We shut off all the lights and I press play. This is the moment our entire team has been working for. Over the course of this four day Indian wedding, we plan, review, record, edit, film some more, edit a lot more, and then finally put the pieces together to a beautiful soundtrack. All this organized chaos has one main goal in mind – to amaze the wedding guests, the family, and most importantly, the bride and groom. We love recording the bride and groom while they watch their Same Day Edit during the wedding reception. I love their priceless reactions of awe and astonishment and that instantly makes me forget the sleepless, anxiety-packed nights of working under tremendous pressure to meet my expectations of perfection. Especially these reactions. Take a look. Watching the bride and groom, my favorite moments is when the the bride sees the “Introducing Mr. & Mrs. Bhangoo” marquee on the Theater and simply gets excited as she can feel a build up happening. Once their grand entrance happens in their Same Day Edit, the bride and groom applause. For me, this is a humbling and rewarding experience. I hope you enjoyed this beautiful Indian Same Day Edit film from Fresno, CA of Davinder and Harpreet. Are you looking for an Indian Wedding Videographer? We have also created a First Dance Instagram video as part of our #WeddingMoments campaign that I think is beautiful. We love creating these short 1 minute “moment” films as it really allows me to show a certain moment of a wedding, but also allows the viewers to see our approach to filming each segment (or moment) of the wedding. As you can see here, this First Dance is really beautifully done. Starting from the shot placement, to the cinematography and finally to the edit, it’s a beautifully done First Dance Wedding Moment Video. This is Davinder and Harpreet’s Instagram Teaser of the Same Day Edit we posted a few days after their wedding. I love how it turned out. Enjoy. We are a San Jose Indian Wedding Videography company that creates Cinematic Films and Same Day Edits. Such a beautiful & stunning Video ❤ Loved it. Congratulations to the Bride & Groom.